As many of you know our year ended with a great loss. Dad died on December 28th at the age of 101. Although he was ready to go we still miss him greatly. 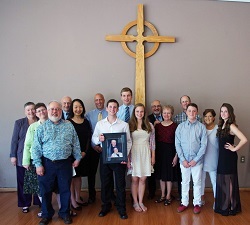 The Henn/Werner family gathered together for his Memorial Service at Clayton Valley Presbyterian Church in California the end of May. Ralph and his family came from Minnesota as well as our families from Georgia and Arizona as well as our cousin George and his wife, Li, from New York. We enjoyed a day together in San Francisco with Thomasina’s sister Micheline and family. Although we included this picture last year, we want to include it again as it was the last one of Dad taken at Thanksgiving dinner at the retirement home. Our activities this year have been pretty much the same. Our church choir presented the Handel’s Messiah, the Mozart arrangement, in its entirety. We are enjoying the 2-CD set. Werner also enjoys formatting and posting videos of the weekly music selections from our church services on vimeo.com/belpresmusic. We both continued to sing with Seattle Pro Musica. Werner also sang with their smaller ensembles, the men’s Orpheon and their Chamber group Vox which entailed learning a lot of extra music and performing additional outreach concerts. Succumbing to aches and pains, we both decided that it was time to retire from singing with Seattle Pro Musica and are enjoying our extra free time. We both continue to enjoy attending the Issaquah Village Theater, one of the top regional theaters. We just saw an outstanding presentation of My Fair Lady. Our Family trips this year included a visit with Brian and his family in Georgia. We enjoyed hearing Grant and Tyler play in their outstanding High School bands and watched Allyssa play lacrosse. Then in May we drove to Arizona to visit Mark’s family and attended our oldest Grandson Zachary’s (an Arizona Scholar) High School Graduation. Earlier in the year Granddaughter Lauren’s HS soccer team won the State Championship and she was honored as a State All-Star. Mark coaches Aidan’s soccer team. Zachary now attends the University of Arizona in Tucson majoring in Political Science. In September we drove to Montana to visit with David, Carol’s brother and family as well as visit Carol’s Aunt Adeline and other relatives. Our time there was enjoyable and relaxing. In June we finally experienced our Alaska cruise. We took the train to Vancouver, BC to catch the ship and visited Ketchikan, Hoonah, Juneau, Sitka, Hubbard Glacier. Along the way we saw incredible sites, having unusually clear weather, in the 70’s – 80’s most of the time, taking daily shore excursions. We debarked in Seward and were picked up by Mary and Duane, Carol’s sister. We spent a relaxing enjoyable six days with them, even getting a sled dog ride at the Iditarod headquarters in Wasilla. One small note: we will be incorporated into the city of Sammamish as of January 2016. So update your address books from Issaquah to Sammamish, everything else remains the same.